The Paris Agreement reaffirmed the role of emissions trading as an important policy tool for mitigating climate change. Equally, emissions trading schemes (ETSs) are increasingly being developed and interlinked. Despite these developments, no agreement has been reached regarding the legal character of what is being traded. Generally, ETSs involve tradeable statutory entitlements that take the form of emission allowances or carbon credits. Legal uncertainty surrounds whether emission entitlements are capable of constituting property; and, if so, what rights, corresponding duties and liabilities they confer on holders. 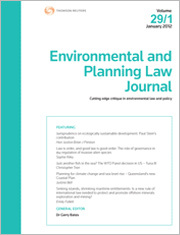 In this article, the authors argue that the legal character of emissions entitlements can influence the functioning of emissions markets, which has ramifications for achieving the environmental goals of ETSs. The authors identify the methods that legislatures could adopt to characterise emission entitlements, and evaluate limitations of the current approaches. To conclude, the authors explore how top-down, international standards could harmonise and clarify the legal nature of emission entitlements. This article evaluates Australian and overseas experiences of commissions and inquiries in connection with nuclear issues before analysing the 2016 South Australian Nuclear Fuel Cycle Royal Commission (NFCRC). Australian practice is contextualised with reference to the British and French nuclear tests that have shaped community opinion, and the United Kingdom and New Zealand experience with nuclear power generation that has impacted upon policy. The functions, characteristics and legislative basis of commissions and inquiries are briefly examined, and other Australian experience, including the Ranger Uranium Environmental Inquiry, is summarised. Public involvement, and concerns about risk and process regarding the South Australian NFCRC are reviewed in more detail. Conclusions are that commissions and inquiries are a useful tool to generate information and enable community debate, but that they remain constrained by their functions and characteristics in limiting potential for change, particularly where environmental effects may be significant, participation is inadequate, consent is not given, and there are issues of public trust. The current regulatory regime in forest management in Victoria, at both a public and private level, displays very little regulatory oversight that addresses environmental risk or the need for incentives for best practice management at an operational level. The stated aim of sustainable forestry and the attainment of ecologically sustainable forest management appears a slim hope based around current regulatory structures. This article presents an argument for a hybrid risk-based/incentive model for forestry practice in Victoria, that would address current regulatory gaps and arguably provide a firmer foundation for the use of principles of ecologically sustainable development. Risk-based regulation is being increasingly adopted by regulators as an alternative to prescriptive regimes in order to reduce complexity, inefficiency and compliance burden. The Western Australian Department of Environment Regulation (DER) has recently adopted a risk-based assessment framework in discharging its environment regulation functions under Pt V of the Environmental Protection Act 1986 (WA). These reforms are designed to provide a consistent approach to authorising and conditioning licences and works approvals in order to prevent unacceptable risk of harm to public health or the environment. This article identifies key areas that could be adopted by the DER in order to improve environmental outcomes by being adaptive and innovative to changing understanding of risks and impacts. For the PDF version of the table of contents, click here: EPLJ Vol 34 No 1 Contents.